Casein Protein is a slow release protein designed to be consumed between meals and before sleep to help your body build and recover muscle. 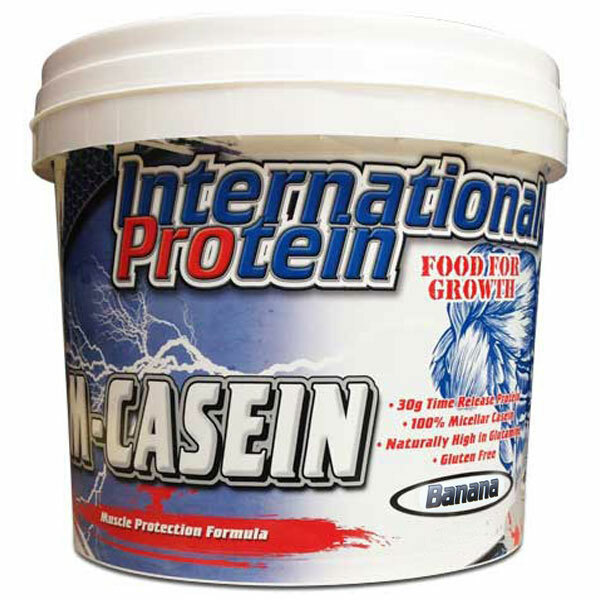 International Protein now brings to their range a highly advanced casein to give you the best results! How does International Protein M-Casein work? Natural Muscle Protection: High levels of threonine, glutamine and arginine, the ‘glucogenic’ amino acids which lend themselves to glucose production during exercise and may prevent muscle breakdown. Slowly Digested: Quality micellar (native) casein proteins for sustained and efficient digestion for up to 7 hours, making it perfect for use before sleep or between infrequent meals. Increased Amino Acid Absorption: The slow digestion rate provided by micellar casein helps improve the absorption rate of casein’s unique amino acids, including muscle sparing glutamine, threonine and arginine. Prolonged Positive Nitrogen Balance: Casein’s unique gelling properties during digestion help slow the release of amino acids prolonging the body’s state of Positive Nitrogen Balance (PNB) for maximal muscle growth & recovery. Naturally High in L-Glutamine: 20% of the amino acids in Micellar Casein are Glutamine to help spare muscle during training. Naturally High in Calcium & Phosphorus: Two synergistic minerals that are key to athletic performance. Calcium: Is essential for efficient muscle contractions. Phosphorus: Can help decrease lactic acid levels during training. Phosphorus also produces high energy molecules such as ATP and Creatine Phosphate. These molecules power muscle contractions during weight training. No Aspartame: Sweetened with sucralose for a pleasant taste and no unwanted compounds. No Fillers or Stabilisers: Just 30g of high quality sustained release protein in each serve. No Gluten: No cheap glutamine peptides derived from hydrolysed wheat or low quality wheat proteins making it suitable for coeliacs and people with wheat allergies. Rich Dessert Texture: M-Casein is naturally thicker than WPI and mixes into a thicker, more dessert-like consistency. It can be used to make protein ‘pudding’ by adding half the recommended amount of liquid, or into a full bodied shake by using the recommended amount. M-CASEIN protein is designed to promote muscle growth and recovery by keeping the body in a growing state. Buy International Protein M-Casein from Fitness Market and save! 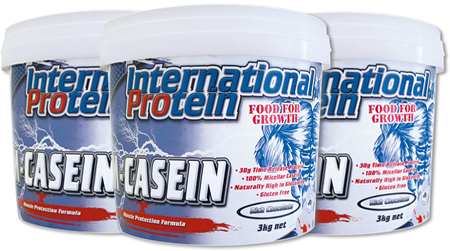 With our efficient dispatching and quick delivery throughout Australia, International Protein M-Casein can be yours sooner. Below you can rate and add reviews for International Protein M-Casein.